You want to garden. You want a pet fish. You’re pressed for time, and even more pressed for money. What is there to do?! Simple. Consider an aquaponics system. Aquaponics is essentially the combination of hydroponics and aquaculture. Hydroponics is, very simply, a technique of growing plants in mineral nutrient solutions and water without the use of soil. Plants are usually grown with their roots in a solution, often with the addition of gravel or other “sand” like materials. Aquaculture, on the other hand, is the farming of fish under controlled conditions. If you’re interested in trying your hand at either of these methods of growing but aren’t yet ready to take the leap to try both, consider installing an aquaponics fish tank in your home. Is Aquaponics Right For You? Aquaponics is the combination of aquaculture and hydroponics. It removes the major downside of both hydroponic and aquaculture systems – namely, the need to provide nutrients in a hydroponic system, and the need to remove waste in an aquaculture system -and instead creates a symbiotic system in which the waste of your fish feed the plants, and the plants help to filter the waste. Aquaponics can be as complex or as simple as you’d like to make it. You can produce both fish and vegetables for eating, or fish and plants for visceral enjoyment – it’s all up to you. Here’s how it works. Grow beds are filled with a medium like gravel or clay pebbles. Plants are usually grown in floating foam rafts or in some other method that allows fish water to circulate up to water vegetables. Through this set-up, the plants extract the water, vitamins, and minerals they need to grow. They remove the impurities from the water for the fish, returning the water to a neutral balance. As they extract this water, bacteria that live on the surface of the growbed convert ammonia wastes from the fish into usable nitrates for the plants. On the flip side, fish benefit from your aquaponics set-up in that they are granted a clean source of water at all times. You don’t have to worry about your fish getting sick as a result of water quality issues, because the water is constantly being filtered back up to feed your plants. Aquaponics is an excellent method of growing fish and vegetables that requires no cleaning, no fertilizes, and no weeding. It requires minimal electricity, and since water is constantly being recycled, it is incredibly energy-efficient. While there are some restrictions as to what kinds of vegetables and fish you can grow, the following species tend to be extremely successful in an aquaponics system. For fish, consider species like tilapia, sunfish, crappie, koi, goldfish, carp, perch, catfish, largemouth bass, blue gill, and other fish like guppies and tetras. Note that some of these fish are not edible, and should merely be kept for ornamental or recreational purposes instead of those that are more agricultural. On the plant side of things, you can successfully grow a number of vegetables, including leafy greens like lettuce, kale, swiss chard, and arugula. Herbs like basil, mint, and chives also grow well in an aquaponics system. Most house plants also do well in an aquaponics system, as they tend to be low in maintenance needs. Although other plants can be grown in an aquaponics system, those that tend to have higher nutritional needs can be a bit trickier – though not impossible. If you have a well-stocked, well-established system, you can grow plants like peas, squash, broccoli, cucumbers, tomatoes, peppers, corn, onions – even bananas and dwarf citrus trees! Because an aquaponics system is truly an all-inclusive set-up, the sky’s the limit in what you choose to grow. 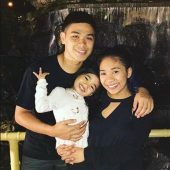 Choosing a aquaponic fish tank setup is an entirely different beast than choosing a tank for a simple, fish-only aquarium. There are multiple considerations you need to make because you need to make sure that you are providing a conducive environment for both fish and plant growth. For starters, you need to make sure that your tank is absolutely watertight. This sounds obvious, and is probably already a no-brainer if you are raising fish. However, you also need to inspect other areas besides the glass part of the tank. For example, make sure that the areas around the plumbing fittings are airtight, and use rubber gaskets and silicone to make sure no air can escape. The tank also needs to be sterile. It cannot contain any toxic material, since this is where your fish need to live. These fish will in turn provide nutrients to other living organisms in your system, like plants and bacteria, so it’s important that the tank wasn’t ever used for another purpose (particularly one that could be dangerous to your new living creatures). Similarly, you should not use metal containers, since they can corrode and affect the pH and ammonia balances in your tank. A good aquaponics system will have a finely tuned balanced between the amount of fish waste produced and the plant’s ability to convert that waste back into food for the fish. Your ratio of grow bed to fish tank has to be spot-on for this to work. The volume of your grow beds should be equal to the volume of your fish tank. After some tie, and after you’ve become familiarized with how your aquaponics system works, you can increase your ratios to two grow beds to one tank, but it’s important not to get ahead of yourself when you are just getting started. In terms of the tank itself, your fish tank will vary depending on the type of system you have. Consider the type of fish you want to raise (particularly their size at purchasing time as well as how big they can potentially grow) and purchase a tank that will match their patterns. For example, if you want to grow larger, edible fish like tilapia, you will need a very large aquaponics tank. In general, tanks that are designed to hold food-species fish need to be at least 45 centimeters in depth and hold 200 liters of water. Some people are very concerned about the shape of their aquaponics tank, but really, it doesn’t impact the growth of your plants or fish in particular. Purchase a tank whose shape works best for the dimensions and space available, as well as your personal preferences. Keep in mind that a round or oval shaped tank can help reduce the likelihood of dead zones (areas where there is minimal water flow) while a short, wide fish tank offers a higher water surface area to water volume ratio. This can result in a more efficient gas exchange, reducing the amount of work and money you need to put back into the tank. What’s more important than tank shape is that you put it in a thoughtfully chosen location. Don’t put it on top of a weak structure or any area where the temperature could fluctuate – such as in front of a window, where drafts and direct sunlight can cause wide swings in the temperature of your tank’s water. Think in particular about the needs of your fish when selecting the area where your tank will reside. 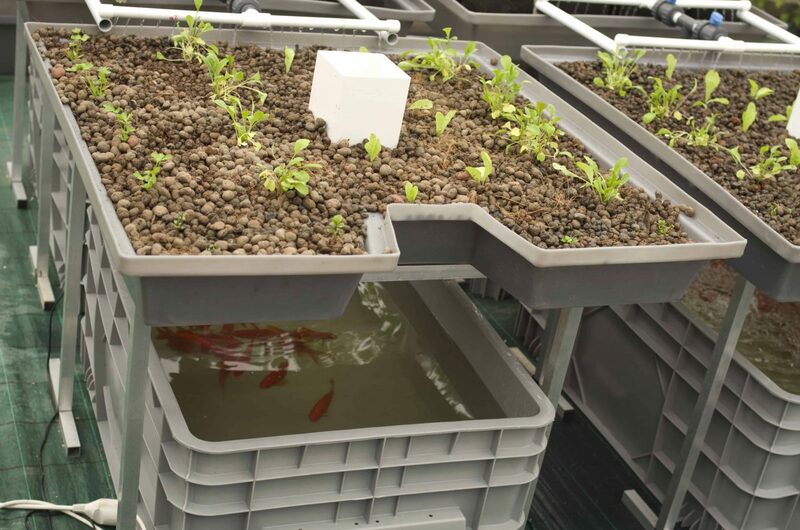 If you’re just starting out in your aquaponics endeavor, then choosing the right equipment can be a bit daunting. Consider our top three recommendations for the best aquaponics fish tanks for beginners. Back to the Roots is a scaled-down aquaponics system that is designed specifically for growing microgreens. As a self-cleaning tank, this system is one of the most popular for beginning hobbyists because it is easy to use and to install. Everything is included – all you need to do is pick out the fish (and the manufacturer even includes a coupon to do so). You can harvest your greens in as little as ten days, and with a 100 percent money-back guarantee, you really have nothing to lose with this low-cost option. The AquaSprouts Garden is a bit pricier than Back to the Roots, but it’s well worth your money. This grow system fits any ten-gallon aquarium, meaning it can be attached to a pre-existing fish tank. Unlike the Back to the Roots, it can grow any type of plant, including vegetables, decorative plants, and herbs – not just leafy greens. As an updated model of an earlier version, this product even comes with adjustable drain extenders so that the water flow isn’t quite as noisy – making it ideal for a bedroom or classroom. Another middle-of-the road option for a price and space-conscious beginner is the AquaTerrium Planting Tank. This tank is one of the more attractive options, blending a gorgeous plant terrarium with an aquatic ecosystem for your fish. This system comes with a 2.65 gallon glass tank, an aquaponics waterfall, a rock space, and even artificial plants to keep your fish entertained. Because this tank includes a waterfall (craftily concealing an integrated water filter and pump), your fish are always happy and healthy while your plants are adequately fed. 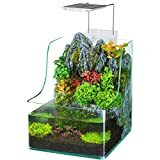 While this aquarium is designed for smaller fish and the growing system is really only intended for small, leafy plants like herbs, greens, watercress, and English ivy, it is one of the most attractive models on the market. Now, you might be wondering what to do if you already have a fish tank and aren’t willing to make the leap to upgrade to a full-blown aquaponics system. 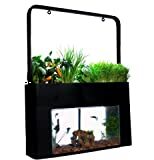 Luckily, there are multiple “adapters” that can allow you to create an aquaponics fish tank from your existing setup. One of the best is the Elive AquaDuo 10 Aquarium Water Filter. This filter can be used on any tank type, regardless of whether it is freshwater, saltwater, or reef. It offers an exceptional appearance, with a crisp design and allowing for multiple ornamental plants to be grown, such as peace lilies, bamboo, arrowhead plants, and more. You can use this with traditional power filtering with a waterfall, or with a quieter surface discharge depending on your preferences and where you intend to set up your tank. To use this on an existing tank, all you need to do is select your filtration style. Choose between a natural aquaponics filter or a traditional power filter, or use both. Then, install a filter cartridge, and adjust the shroud so that it meets the aquarium bottom. Choose how you want your water to discharge, and then add your plant. Plants can be rooted directly into the planting media extracting nutrients. You won’t need to add chemical filtration or change the water at all. If you’re pressed for time or space, or are simply looking for that next step in your home cultivation hobby, then aquaponics might be a good choice for you. These low-cost, low-maintenance systems are a great way to promote eco-friendly agriculture right within your own home. As a beginner, you likely won’t get rich or replace your entire diet with aquaponics system-grown foods. However, you might find that what started as a hobby will soon evolve into something you truly enjoy and can profit from. If you have a small amount of space, time, and money to spare, and are interested in investing in what should be regarded as the ultimate recycling system, then an aquaponics system is the right choice for you. Why Do Fish Jump Out Of The Tank?